Mint is the online personal accountant that keeps track of all your account data and collates them into one easy-to-use and intuitive interface. If will monitor your accounts and give you easy way of seeing your total and individual expenses. Organize and manage your financial life! After accepting your account information, Mint will gather all information it can and enable you to view savings, investments, insurances, mortgages and more, all from one place. You can not only view current state of your account, but also its evolution over time. You can set goals, limits, budgets and targets for your savings and expenses within given period. Keeping an eye to your personal finances is not an easy task, especially if you have several bank accounts that you use on daily basis and family members who have access to them. However, this process can be made incredibly streamlined if you sign up for Mint.com, great personal financing service that can provide you with the complete breakdowns of your spending habits and tools for creating future spending goals. 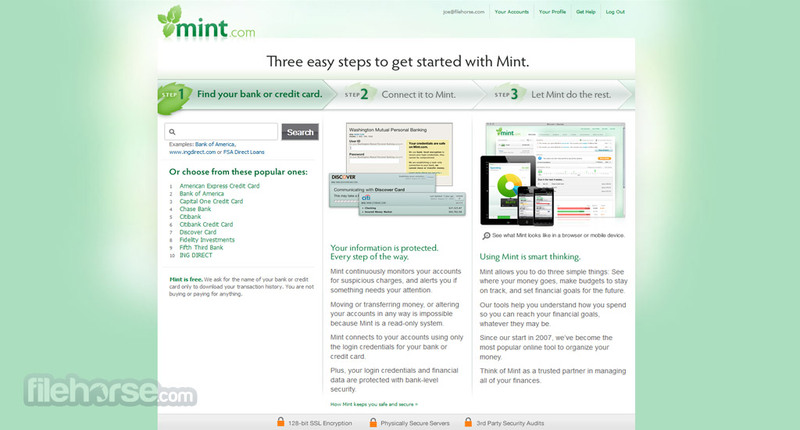 Three years after its creation in 2006, Mint.com service was purchased by Intuit, one of the largest US-based companies that develop tax preparation and other financial services for individuals, accountants and smaller businesses. With their help, Mint became one of the leaders in the sphere of free online personal finance service, catering to more than17 million individual financial accounts from 10 million users and 16 thousand US and Canadian financial institutions. Mint free web-based personal financial management service that enables users access to wide arrange of tools that can help them manage all their financial accounts, and have full control over their bank credit card tracking, investment overview, loan transactions, balances via interface that can be accessed on any modern internet connected device with a capable browser (PC, Mac, laptops, tablets, smartphones, both iOS and Android). What can Mint do for you even if you are individual who is just striving to get a better overview of your bank accounts? It provides effortless user interface that can help you easily see visual breakdowns of your spending in all categories, easy setup for your future goals (along with advices, reminders and encouragements that will help you stick to your goals), and comprehensive suite of tools that will help you stay on your budget. By automatically organizing spending categories and showcasing you your spending habits, you can effortlessly see where every dime of your monthly pay went and how you can optimize your budget. Organize and manage your financial life! With great tools that enable anyone complete automatic analyzing of their bank account, Mint represents invaluable service that can turn your life around and enable you to save money for upcoming life events that will shape your future. Most importantly, all of this is given to you for absolutely free! Just create your Mint profile, add your bank accounts, and you are ready to start getting reminders about your spending goals, suspicion credit card activity and more. Mint.com is a very easy to use and beautiful site, which is noticeable from the moment you land in its main page. 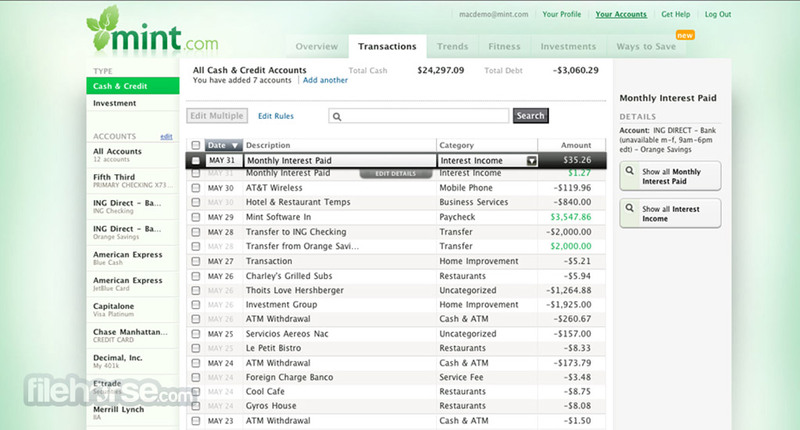 Green visual theme and easy to spot navigation options are present through entirety of this financial app, with tools and services being always one click away. All your bank account data is collected inside one simple dashboard that offers you quick access to visual representation of your spending habits and tools for planning future goals. Same interface is perfectly downscaled to smaller tablet and smartphone display sizes, enabling you to remain in touch with your spending goals no matter where you are. One of the best features of Mint is that it offers its service to any individual user from United States and Canada for free (other countries are sadly not yet supported). Simply create a new account, and you can access all of its features. Everyone who wants to keep closer look at all of their spending, suspicious credit card activity, budgets and spending goals, needs to try out Mint right now. You can hardly find a better product than it that is free and offers such amount of great tools. Mint makes your financial life simple and streamlined. Sign up takes less than five minutes. 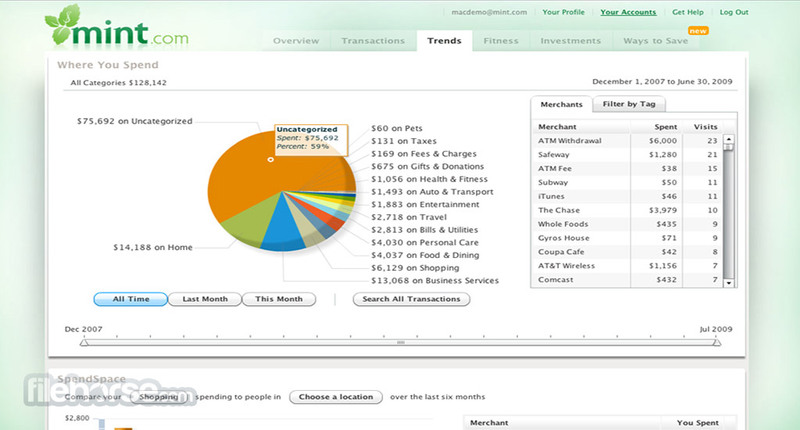 Then Mint automatically pulls all your financial information into one place, so you can finally get the entire picture. Stay on top of your finances. See what's happening with all your accounts–checking, savings, investments, retirement–at any moment of the day. You can even use free mobile apps for tracking your money on-the-go. Organize and manage your financial life! Set a budget and create a plan to reach your personal financial goals. You can track your progress online or stay up-to-date with monthly emails. And Mint will help you achieve your goals faster with helpful free advice and next steps. Mint has more than 7 million users who know their information is always secure. That's because it uses 128-bit SSL encryption–the same security that banks use–and all data is protected and validated by VeriSign and TRUSTe. Plus, since Mint is read-only, no money can be moved in or out of any account.